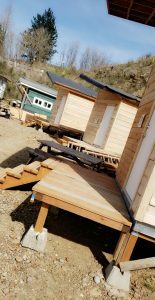 Portland has recently declared and extended a State of Emergency concerning the rising unhoused population through to 2021. This state of emergency allows the City of Portland to expedite processes for permitting and siting for shelters and affordable housing units — which are both costly and time-consuming processes. The declaration allows for waiving certain procurement processes and, on a case-by-case basis, portions of the zoning and building codes. 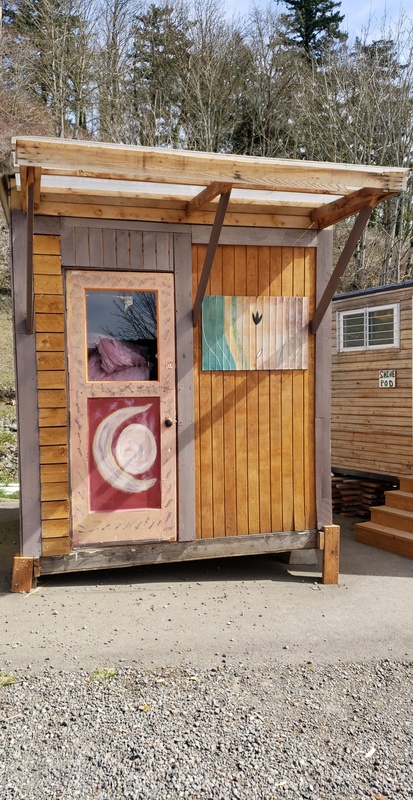 The tiny home movement has recently gone mainstream in many aspects of life – and has most recently become a cost-effective and sustainable solution to houseless-ness. 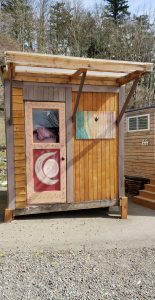 The state of emergency makes it possible for local non-profits and community groups to establish encampments in a time sensitive fashion with structures that serve as emergency transitional shelter. The Central Nazarene Church is located in a section of the city that is under-resourced when it comes to helping our unhoused neighbors. The church recognized the humanitarian crisis of houselessness and looked for ways to work towards a solution to Portland’s housing crisis. This search for solutions led to the development of Agape Village. The Central Nazarene Church is contributing space on their property near SE 92nd and Powell for 15 tiny house structures to temporarily provide shelter to adults experiencing houselessness in the Portland metro area. This project is striving to create a safe site which involves and engages the full community in giving back to our neighbors. The goal of Agape Village is to provide a place for adult individuals and couples to transition into permanent and affordable housing. The village will be modeled similarly to established villages that are currently operating throughout the Portland region. 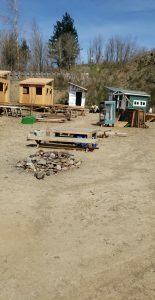 The building of all of the structures is scheduled to be completed on May 1st. The village construction has been led by Cascadia Clusters and Pastor Matt Huff through donations from the Re-Building Center, local faith organizations and community organizations. Central Nazarene Church has established an application process which will require residents to follow certain rules and expectations that contribute to the health and success of the community. 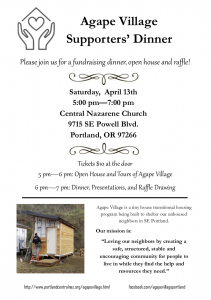 For more information about Agape Village please contact Matt Huff, at mhuff@portlandcentralnaz.org. 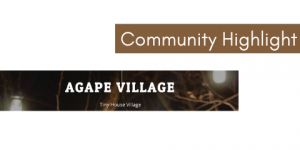 Agape Village still needs support from community members. Be a friend to one of the village residents/guests. 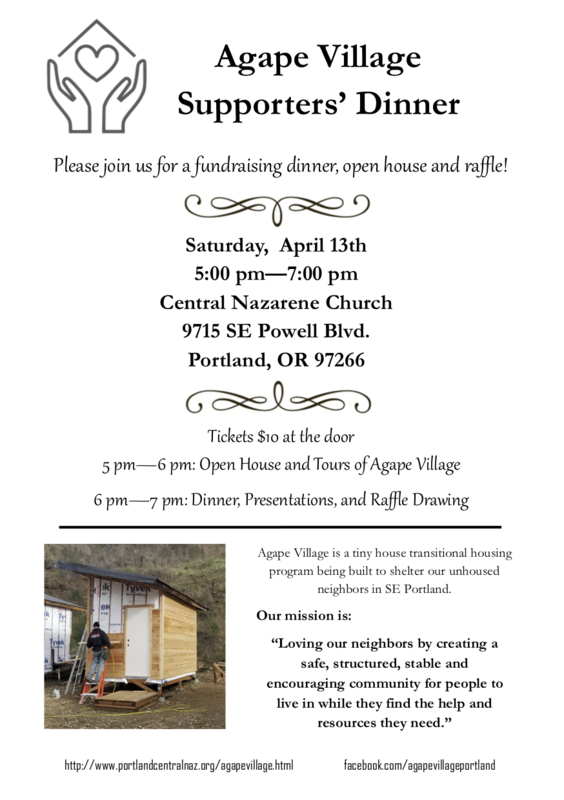 Agape Village is hosting a fundraiser dinner on Saturday, April 13th from 5-7pm. Tickets are available for $10 per person or you can sponsor a table for $833 (the cost of one month of operations for Agape Village). For more information click here. 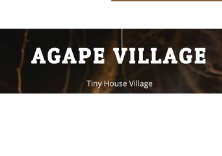 To get the latest updates follow Agape Village on Facebook and listen to this podcast as Pastor Matt Huff shares about Agape Village.